The grape berry moth is an annual problem on about 50% of the grape acres around the Great Lakes in New York, Ohio, Pennsylvania and Michigan. Females glue their eggs on the berries and larvae hatch out and feed in the berries. Insecticides have been used for 100 years to control the grape berry moth and reduce the infestation from 24-30% to less than 1%. 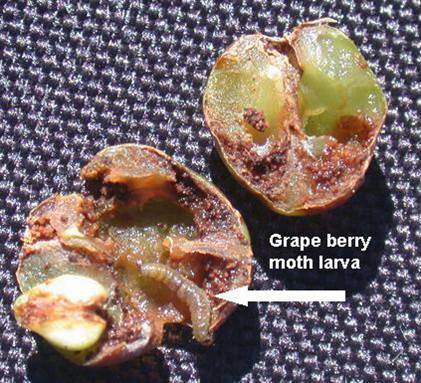 Until recently, broad-spectrum insecticides with long residuals were used to manage grape berry moth. However, new insecticides have been registered and they provide tremendous opportunities to selectively manage insect pests in grape vineyards. “The past 10 years has seen a dramatic change in the spectrum of insecticides available for grape producers, with new modes of action and pest spectra allowing an unparalleled opportunity for growers to target specific pests for control while also minimizing the risk to non-target organisms. There is now increased potential for realizing integrated control, since many of the most effective new insecticides have been evaluated and shown to have relatively low impact on natural enemies. For example, registration of the insect growth regulator insecticides methoxyfenozide and diflubenzuron for use in vineyards and the recent availability of the diamide insecticdes rynaxapyr and flubendiamide allow more selective and long-lasting control of lepidopteran pests without high levels of natural enemy mortality. Authors: Isaacs, R., et al. Title: Vineyard IPM in a changing world: adapting to new pests, tactics, and challenges. Source: Anthropod Management in Vineyards: Pests, Approaches, and Future Directions. 2012. Springer. Pgs. 475-480. In 2008, the apple flea weevil emerged as a serious pest in Michigan’s organic apple orchards with some growers experiencing >90% crop loss. The organic apple growers were spraying insecticides later in the season to kill major pests like the codling moth and the flea weevil emerged as an early season pest. The weevils feed on developing buds and leaves. 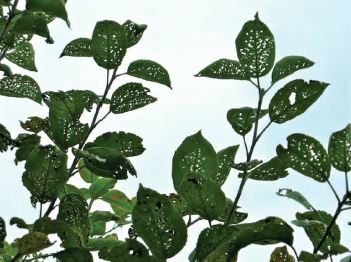 Heavy populations cause significant defoliation of leaf tissue resulting in a lacelike pattern which leads to decreased productivity and possible tree death. Research at Michigan State University led to a solution for the organic growers- spray an insecticide…..
“Organic apple growers in the Midwest appear to have a relatively simple solution to their problems with apple flea weevil, which appeared suddenly as a problem in Michigan two years ago and took out 90 percent of the fruit in some orchards. The best solution, entomologists say, is to spray Entrust (spinosyn) very early in the season, at green tip to pink… The apple flea weevil adult does its most serious damage by feeding on and destroying fruit buds before they have a chance to emerge in the spring. John Pote, a graduate student at Michigan State University working with Dr. Matt Grieshop and Dr. Anne Nielsen in the organic pest management laboratory, gave the good news to organic growers during a session at the Great Lakes Fruit, Vegetable, and Farm Market Expo in Grand Rapids, Michigan, in December. Pote noted that the weevil emerged as a problem for organic growers, who normally do not apply insecticides that early in the season, since few insects become active so early. Title: Organic control for flea weevil. Michigan is the leading producer of tart cherries in the United States, with annual yields of 90.9-127.3 million kg, which represents approximately 75% of the total US production. 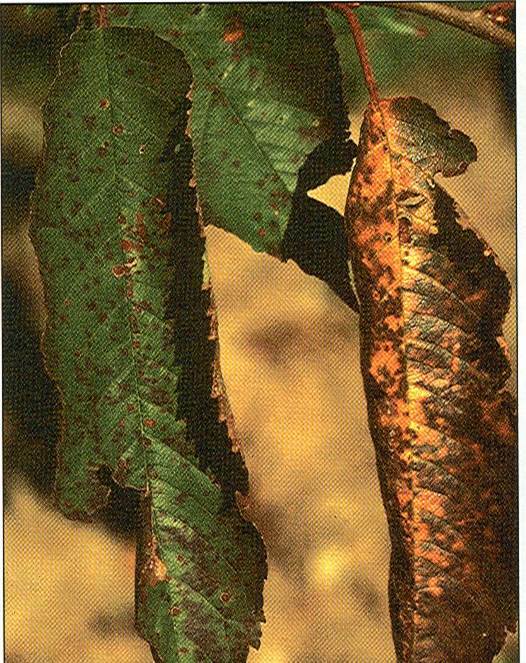 Leaf spot is the most important fungal disease of cherry trees in Michigan. The appearance of numerous spots on the leaf is usually followed by rapid yellowing and dropping. In experiments, it has been demonstrated that poor control of leaf spot can result in 72% of the tree branches dying during the winter months. “Cherry leaf spot (CLS) is the most damaging pathogen of tart (sour) cherry trees. All commercial tart cherry cultivars grown in the Great Lakes region of the United States are susceptible to CLS, including the widely grown cultivar Montmorency, which accounts for more than 90% of the tart cherry acreage in Michigan. Left unmanaged, CLS infection causes significant defoliation by mid-summer, resulting in fruit that is unevenly ripened, soft, poorly colored and low in soluble solids. Early defoliation also delays acclimation of fruit buds and wood to cold temperatures in the fall, increases tree mortality during severe winters and reduces fruit bud survival and fruit set the following year. Author: Proffer, T. J., et al. Title: Evaluation of dodine, fluopyram and penthiopyrad for the management of leaf spot and powdery mildew of tart cherry, and fungicide sensitivity screening of Michigan populations of Blumeriella jaapii. Source: Pest Management Science. 2013. 69:747-754. Rhizoctonia root rot is a serious disease problem in several sugarbeet-growing regions, with the result sometimes being dramatic—and expensive—reductions in tonnage and quality. Low levels of infections can easily cause yield losses in excess of a ton per acre while high infection levels can cut yields by more than 10 tons per acre. The quality of surviving beets can also be impacted, sometimes resulting in significant losses in recoverable sugar. 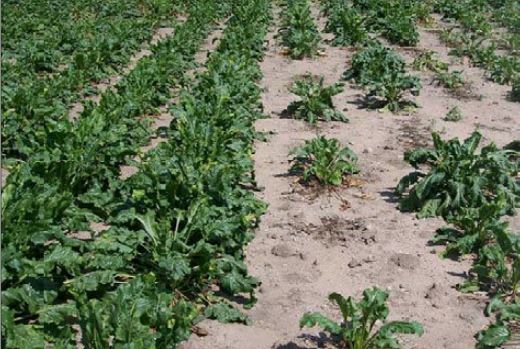 “During 2009 and 2010, the Michigan Sugarbeet Advancement Initiative established a study to determine the efficacy and economic impact of various application strategies for the use of Quadris flowable fungicide to control Rhizoctonia root rot. Authors: Poindexter, S., and Wenzel, T.
Title: Rhizoctonia control with quadris—update on Michigan research. Source: The Sugarbeet Grower. April/May 2011. Pgs. 16-17. Alternaria leaf blight is the most common foliar disease of carrot. Under optimal conditions, severe foliar epidemics rapidly develop, leading to loss of foliage and reduced yields. 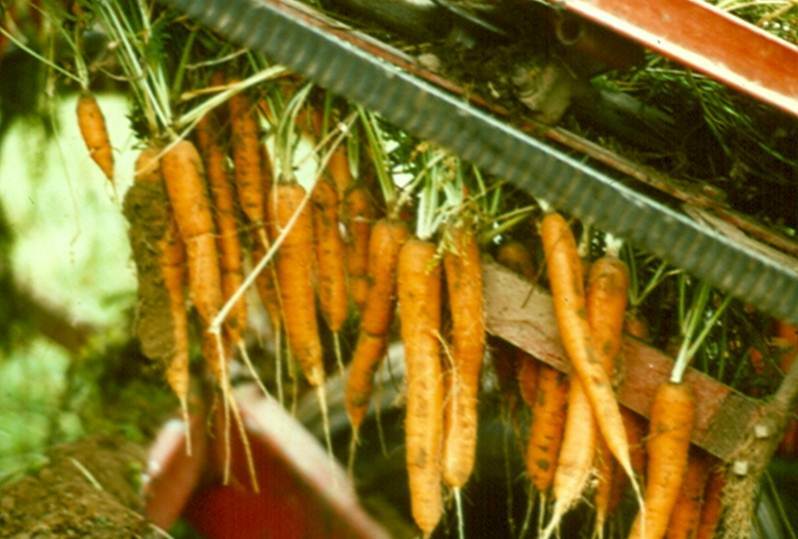 Alternaria also indirectly reduces yields by interfering with mechanical carrot harvests. Leaves weakened by blight break off when gripped by a mechanical harvester and the roots are left behind in the ground. Source: Carrot Country. 2012. Summer:6-8. Japanese beetles are often present in blueberry fields and are collected along with the berries at harvest. Because of zero consumer tolerance for bugs in blueberry products, insecticides are necessary to remove the beetles from the blueberry fields before harvest. Authors: J. Wise¹, C. Vandervoort² and R. Isaacs¹. Affiliation: ¹Department of Entomology, Michigan State University; ²Pesticide Analytical Laboratory, Michigan State University. Title: Lethal and sublethal activities in imidacloprid contribute to control of adult Japanese beetle in blueberries. Publication: Journal of Economic Entomology. 2007. 100(5):1596-1603.